Ben Jackson is OUT of the English Poker Open! With just nine big blinds to his name, he shoved it all into the middle pre-flop, raising against Chris Bjorin with A5. Unhappily for Ben, the Swedish bracelet winner held aces and there was to be no miracle on the board to save the Genting Pro. Ben just told us that he is a little disappointed to never have got going today but found no spots and had some pretty awful hole cards – we can certainly testify to that in the commentary box! Ben is feeling great about his game, however and has already hopped into the £200 + £20 Six-Max Side Event. The players will return to blinds of 10,000/20,000 with 1,000 antes. 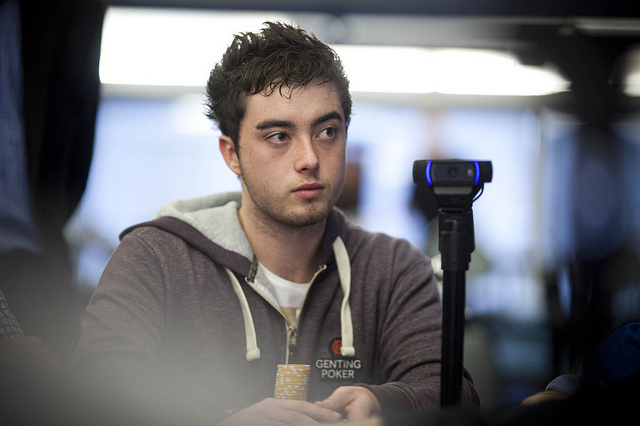 Home » Rakeback News » Ben Jackson is OUT of the English Poker Open!